Did anyone mention baseball in the heat and humidity of the Heartland over the 4th of July weekend? Well, we caught a break! 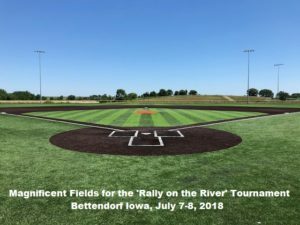 Temperatures were in the low to mid 80s in Bettendorf, Iowa, humidity was low and not a cloud in the sky as teams faced off in 18+ and 50+ divisions. We had two 18+ teams play a 3-game series on Saturday. Our Des Moines Bruins faced the Power Train Bandits. The Bandits were made up of a few players from our Mid-Iowa League along with some players from the Cedar Rapids area. Mid-Iowa league president John Linden organized the Bruins, who won all three games and the championship. 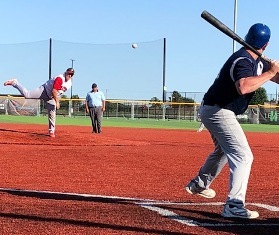 I came in to pitch about four innings late in the day for the Bandits and faced most of my usual teammates and only gave up a couple of runs! The St. Louis Gray Beards defeated the Quad City Blasters to win the 50+ crown. One highlight from the 50+ division, the elder Des Moines Bruins were led by Ron Watson on the hill in game one, who threw nine of the ten innings on the way to a 2-1 walk off victory. I came in to ‘vulture’ the win in the tenth. Unfortunately the Bruins didn’t win the championship but played extremely well with tight, competitive games. 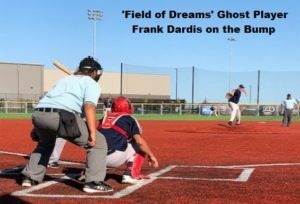 Another interesting tidbit is that one of our pitchers, Frank Dardis, was an extra in the movie ‘Field of Dreams’ and remains a Ghost Player today, entertaining crowds at the movie site and around the world. The competition was very even, the games were all excellent and the players, managers and fans just raved about the experience. We are already planning to ramp this up and we have former players in other parts of the country already expressing interest. We nailed it!